Concerns about a lack of beds for young people with "high risk" mental health problems have been highlighted by an NHS watchdog. There are three specialist in-patient units in Wales, with 51 places. 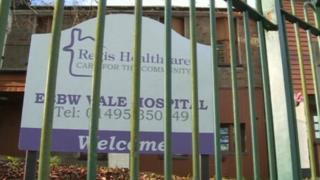 But since December, Welsh patients have been removed from Regis Healthcare in Ebbw Vale because of concerns about their safety. This leaves 27 beds elsewhere and Health Inspectorate Wales (HIW) said the shortage was "not acceptable". The watchdog said capacity concerns were first raised in 2013 and it called on the Welsh Government to take "firm steps". HIW said it was "concerned about the ability" of the community and adolescent mental health service (Cahms) to accommodate high-risk young people at its in-patient units and that the situation was "not acceptable". "This means that young people are not always able to receive timely care close to where they live and are having to be placed out-of-area," said the report. The Regis Healthcare unit currently has 12 beds for 13-18 year old patients but this has been reduced from 24 beds. Image caption The service is under the "highest level of scrutiny"
HIW said at the time of writing its review, 11 of the 12 beds were occupied by English patients. But it still remained "a service of concern", was under the highest level of scrutiny and NHS Wales commissioners would not allow Welsh patients to be treated there. "Until the service can demonstrate that the improvements made in recent months can be sustained it is unlikely that any increase in capacity will occur," said HIW. There had been concerns after an inspection a year ago about use of restraints, including the case of a young patient restrained for more than an hour and a half. Back in December, Regis Healthcare said "historic reports are not a judgement of the current situation" and it had new management. There are also capacity issues at the other two Welsh units. Ty Llidiard - operated by Cwm Taf health board in Bridgend - has 15 beds for 12-18 year old patients. But it is under a "restricted criteria" for referrals until improvement work is completed this year. The other unit at Abergele, Conwy, has 12 beds but has recruitment issues. "On an all-Wales basis, Welsh Government needs to review the demand for these services against the ability and capacity within CAMHS units to ensure young people can receive the treatment they need in Wales," said HIW. A wide-ranging review into all aspects of young people's health care makes 37 recommendations for improvement. A Welsh Government spokesman said: "We are committed to providing the best healthcare for children and young people. "This review looks at inspections of NHS and independent healthcare facilities carried out over the last two years. "The review draws together key themes and we will consider its recommendations as part of our ongoing work to improve services for children and young people."